This is Part IV of a multi-part series chronicling my motorcycle adventure from Tokyo to Sapporo and back again. Please note that this part is out of sequence and doesn’t talk about any riding whatsoever. However, it is still part of my adventure and deserves to be part of this. Furano is a very nice little town, located just over 2 hours from Sapporo. This is by express train. I was mentally exhausted from riding for the past few days, and I was not looking forward to the ride home either, so I took this time to just relax and not do any riding at all. I purchased a round trip ticket to Furano. Furano is known for only three things. One of these three is a famous Japanese drama. 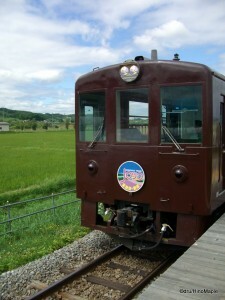 The theme song is played throughout Furano during the summer months. They even have a museum dedicated to the show. Other than that, winter is very popular. Furano is very popular for skiing and other various winter sports. While the town itself isn’t as big or popular as Biei, it is still a nice place to visit. Note that Biei is next to Furano, but more popular as there are many ski hills and onsens. The main reason I wanted to go to Furano was for the lavender fields. There are many pictures on the internet showing the vast purple fields. Many Japanese people dream of visiting these fields, but relatively few ever go. From June until August, if you are in Hokkaido or Sapporo, you should try your best to get to Furano. They build their own special station just for the lavender fields. There is only one place to really see lavender, Farm Tomita. It’s a relatively short 7 minute walk from the summer station. Considering it takes that long, if not longer to get parking, it’s much easier to walk from the station. The walk itself is very nice as you are walking along many farm roads as well. 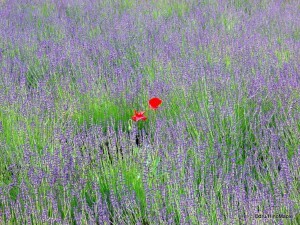 A rogue poppy in a field of lavender. The farm itself is very straightforward. Wear good walking shoes that can get a little dirty, and prepare for some steep hills. It’s very busy in the summer, but if you take your time and enjoy things, you’ll be fine. 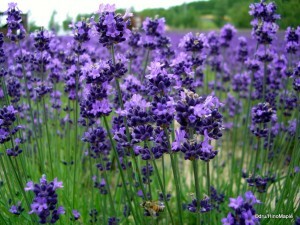 While the farm’s main flower is lavender, they have various other plants to make things beautiful. 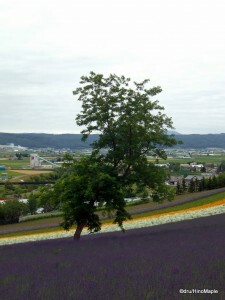 The lavender industry in Hokkaido is not viable economically, so they tend to focus on the tourist trade. This makes things much better as seeing nothing but lavender could be boring. 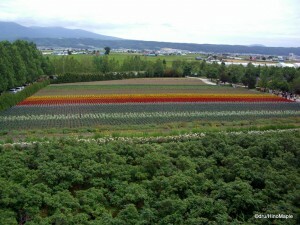 Farm Tomita is very much a tourist destination, so they have various flowers to make things more picturesque. They also have various goods for sale. A majestic tree in the middle of the field. Food is one of the most important and popular things to buy when you travel. Furano is no exception. One of the few things you should try is lavender soft serve ice cream. While it doesn’t sound very good, it mainly tastes of vanilla with a lavender smell. It’s very good, and I highly recommend it. You can also buy melon pan. It’s a popular food in Japan. Melon pan is a soft bun with a sugar topping. The last food item you should try is the pudding. Hokkaido has a lot of dairy farms. They are the major producers of milk and other dairy products for Japan. The pudding was nice and helped pass the time on the train ride back to Sapporo. They do sell honey dew melons, but they are a little expensive. If you have the money, it’s a nice treat, but I doubt it’s so special. The last thing to buy in Furano is lavender goods. They sell everything from soap and perfume to dried lavender. The smell of the lavender fields and the shops are very relaxing. I wanted to buy some potpori but I didn’t have any space to bring it back with me. If I ever go back, I might buy more things. Having a little lavender in your home is great if you have any stress. My train to Furano station. Aside from skiing and the lavender fields, there are a few other things to see and do in Furano. They have a cheese factory and a winery. While many people may not feel that Furano is worth the trip from Sapporo, I still highly recommend it. Sapporo in the summertime is not that special. While going to the town of Otaru (1 hour from Sapporo) is more popular and easier, it probably won’t provide the lasting memories that Furano will offer. Make sure you go when it’s sunny and check Sapporo station for the latest updates on how things look. They tend to put pictures from the day or week before so you have a good idea one what condition the fields are in. This entry was posted in Hokkaido and tagged biei, cheese factory, dried lavender, Farm Tomita, Furano, Hokkaido, honeydew, japan, lavender, lavender field, lavender ice cream, melon, melon pan, Motorcycle, onsen, Otaru, perfume, poppy, pudding, Sapporo, soap, winery by Dru. Bookmark the permalink.